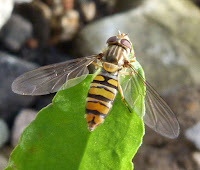 Another impossible insect to photograph as they fly around quickly and incessantly and only land momentarily before flying off again. However, I finally managed to find one that sat long enough to allow me to get a half decent photo. 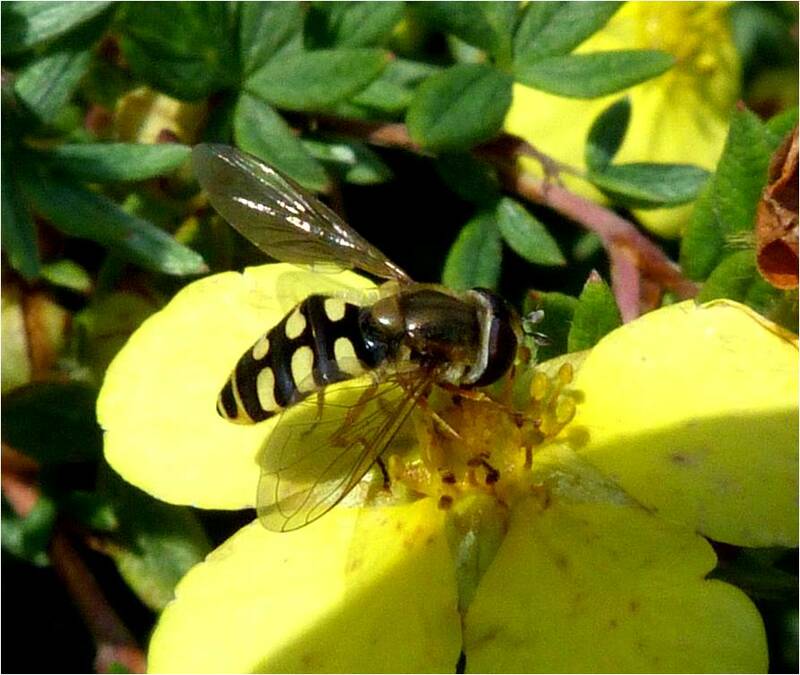 It doesn't look bee or wasp-like as 'typical' hoverflies do. The one obvious feature of this otherwise unremarkable fly is its peculiar ‘beak’. 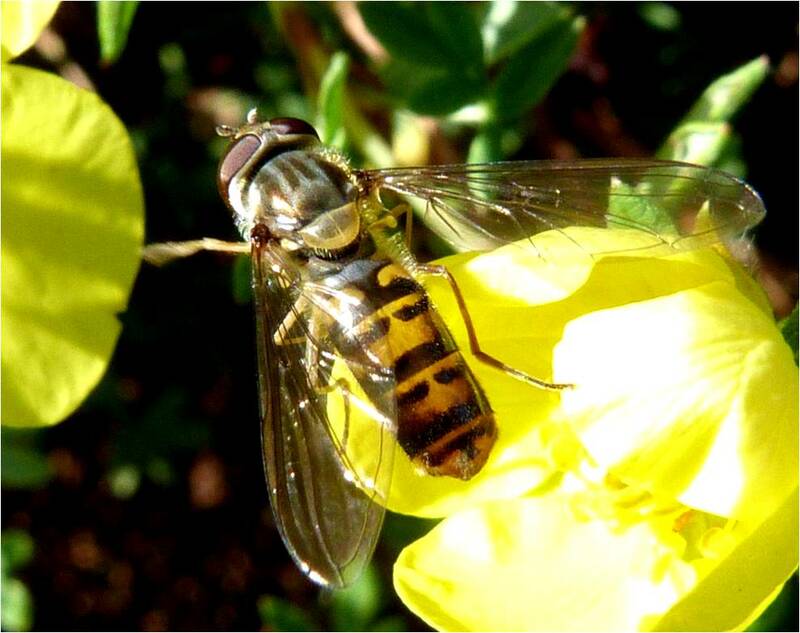 This enables it to reach into reasonably tubed flowers, like bluebells, for food that other hoverflies cannot reach. 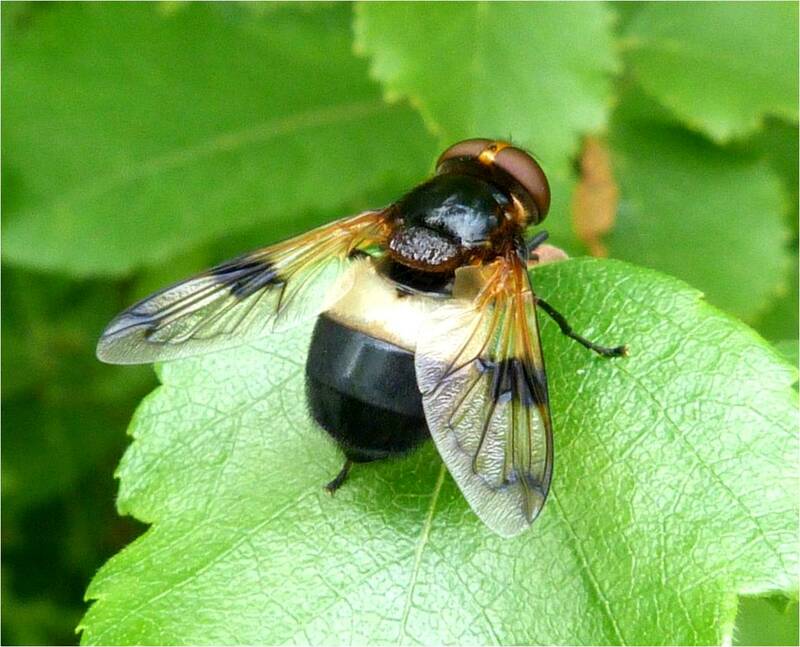 Its abdomen is orange-brown and sometimes has, as this one, a black stripe around its middle. Its larvae is found in cow and other animal dung. I have to be honest, I just about fell off my seat when I discovered this was a hoverfly. 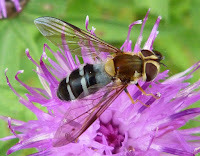 It looks more like a fly than a hoverfly does it not? 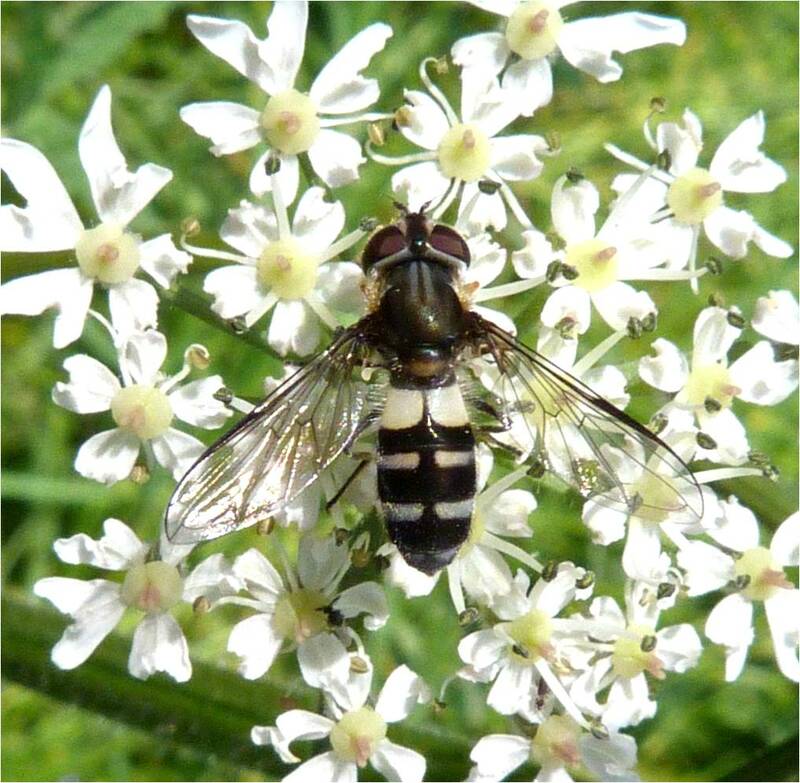 As you can see, it was discovered on these white umbellifer plants, which seems to be its favourite haunt. Anyway, a couple of distinguishing features here - huge red eyes (which seem to contain a pseudopupil - a dark spot in the middle of its compound eyes) and the female (as here) has a pinkish band along its abdomen. It is not easy to see from this photo, but it has almost black wings and its thorax is shiny. It also appears to be common in England but much less common up here in Scotland. The most common and best known of the hoverflies in Britain with very distinctive markings on its abdomen – like thick cut marmalade apparently (eh?)! The markings can, however, vary, as can be seen in the picture at the bottom. 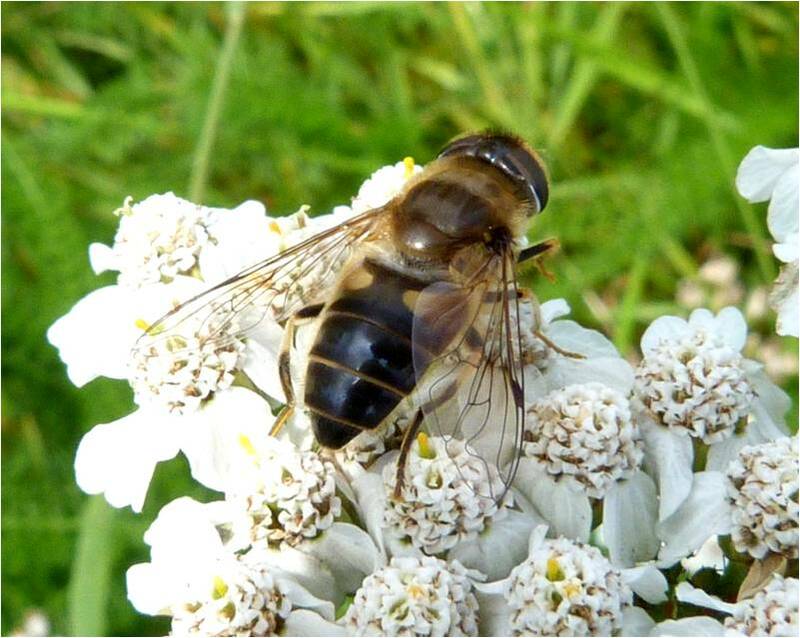 Interestingly, hoverflies that develop in hotter climates are more orange than those that develop in cooler conditions which are much darker and can sometimes be almost black. 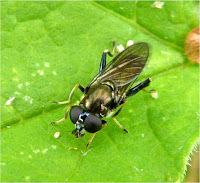 They can often be seen in parks and gardens and are keen aphid eaters. The adults can migrate in swarms to the south. Males, as in the top left photo have large eyes that touch, whereas the females have smaller separated eyes as in the photo in the top right. So thrilled to find this - I've had it on my wish list for years, under the heading 'hoverfly with commas' due to the distinctive comma-like markings on its abdomen. It's fairly rare, particularly in Scotland and I was towards the east coast near Penicuik, which it quite unusual for me. I was also particularly please to get a half decent photo as it was raining and blowing a gale. 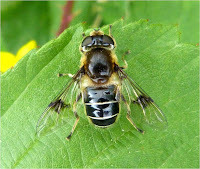 This hoverfly has a shiny black abdomen with whitish bands. 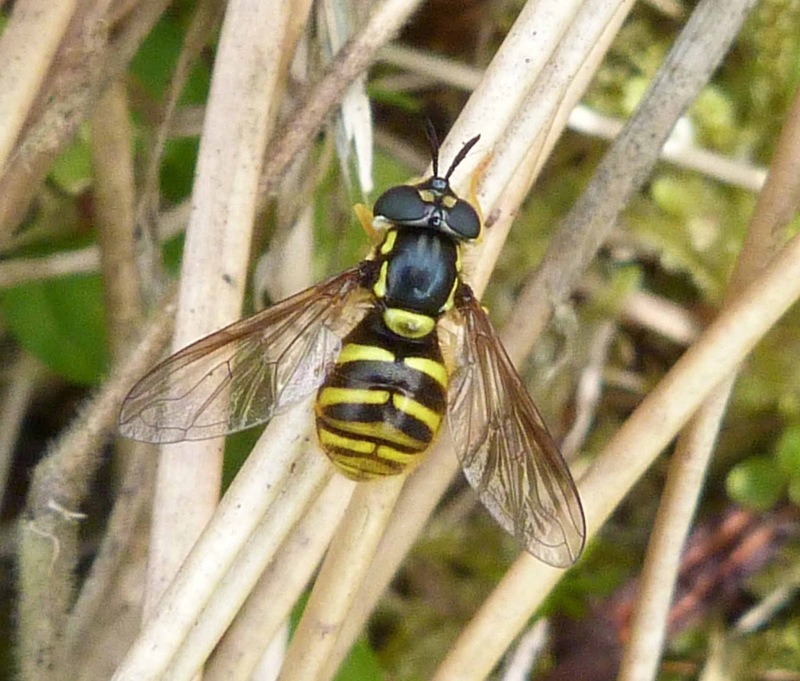 Scaeva selenitica is similar but the bands are yellow. 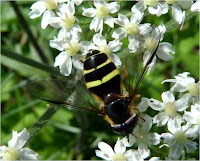 Similar to Scaeva pyrastri above but with yellow 'commas' (known as lunules) Trather than white. Again there are a number of similar species, so the identification is not 100%. 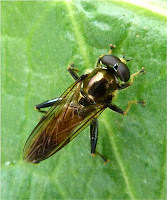 But these are often found near coniferous woodland and eat aphids on pines. 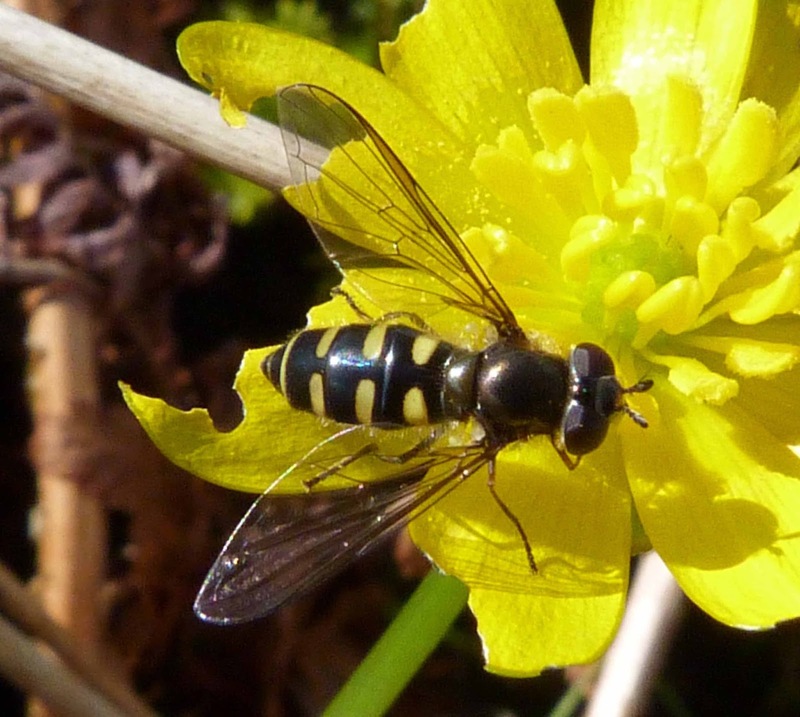 A huge thank you to Mike Kerry for confirming the identity of this hoverfly and for explaining that this is the only female Eupeodes where the abdominal spots reach the margins, as they clearly do here. 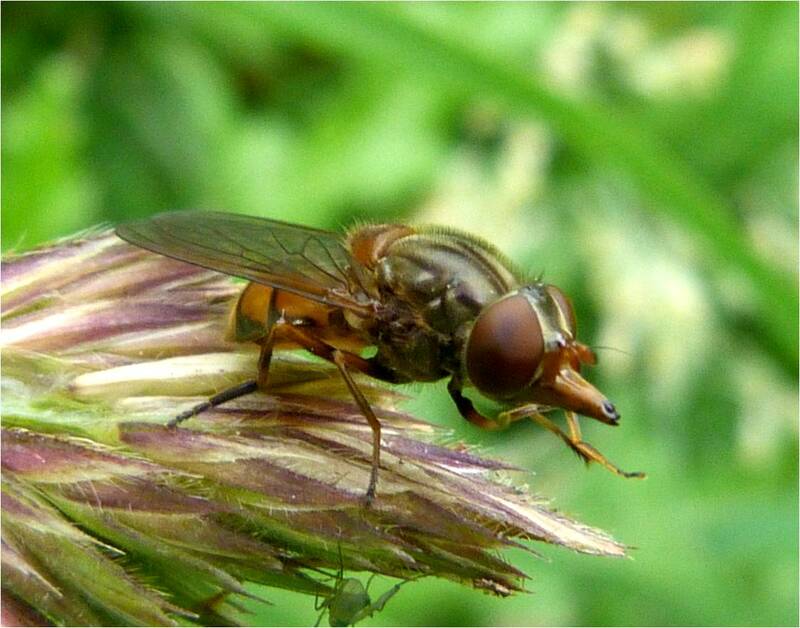 Due to its pointed abdomen, it looks like a female as the males have a more rounded tip to their abdomens. 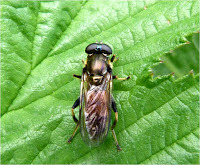 It is quite a large, black hoverfly with three pairs of yellow ‘commas’ on its abdomen. 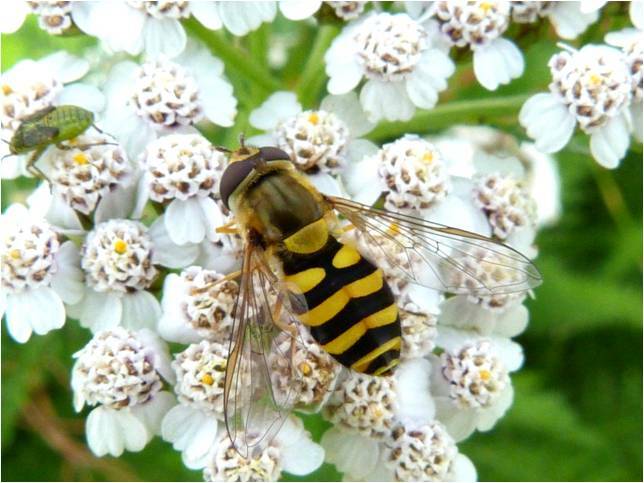 It is very similar to Scaeva selenitica which looks similar, but with narrower white or cream coloured commas. 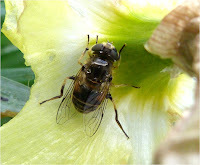 Unfortunately, there’s little information about this insect other than that the adults feed on flowers and its larvae eat aphids and that it is more common the further south you go in Britain. Ok, so this one's a bit more interesting. 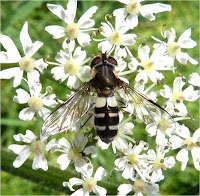 I really struggled to identify this one and then gave up and asked www.ispot.org.uk for help (yet again) and they of course, were able to identify it in seconds and gave me some very interesting information about this hoverfly. 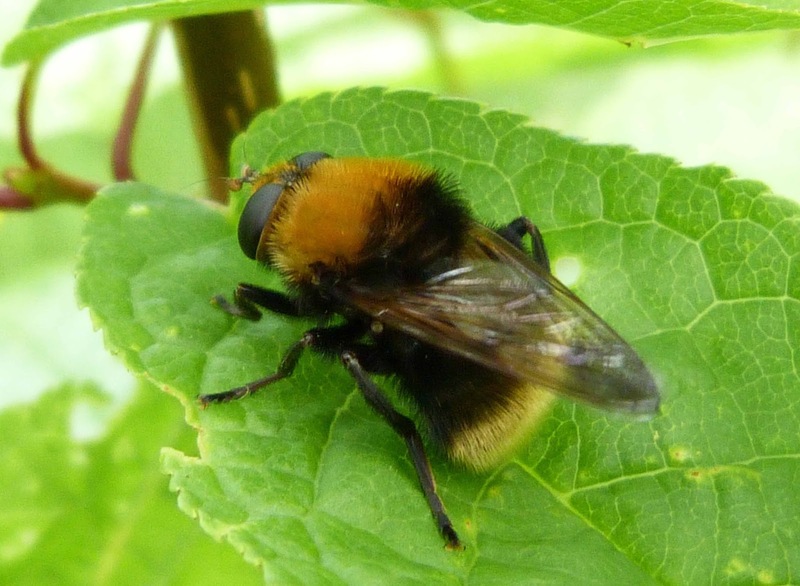 The markings on the abdomen can be variable (I've seen photos with yellow marking on its abdomen, though this one doesn't appear to have any). 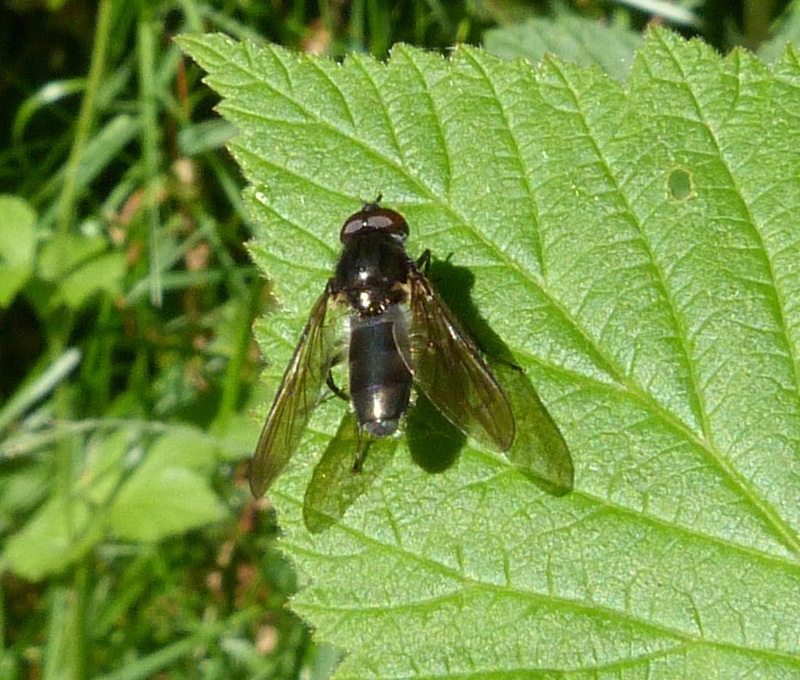 The key features which seems to help with identifying this one are the pale hind metatarsus (which I think is the bit of leg above the black 'ankle') and the distinctive dark markings on its wings. Again, you can tell this is a female as its eyes are separated and not touching as males' eyes do. 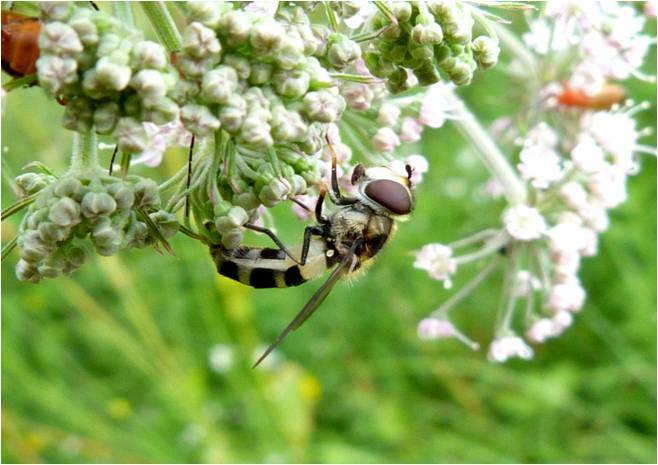 But the 'really' interesting part about these hoverflies is that their distribution is very local with them being an 'upland and northern' species - so those not in an upland and northern area will be unlikely to have come across one of these attractive little creatures. 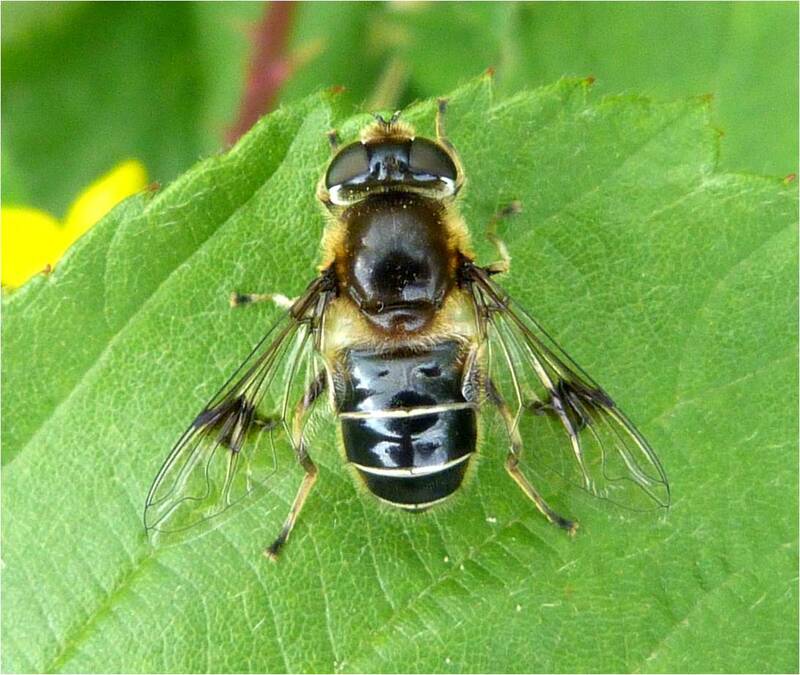 This majestic looking hoverfly is large and fairly distinctive with three pairs of yellow bars across its abdomen which usually don’t quite meet in the middle (photo on the top left), although sometimes the bar nearest the tip of the abdomen does meet up in the middle (as on the bottom). 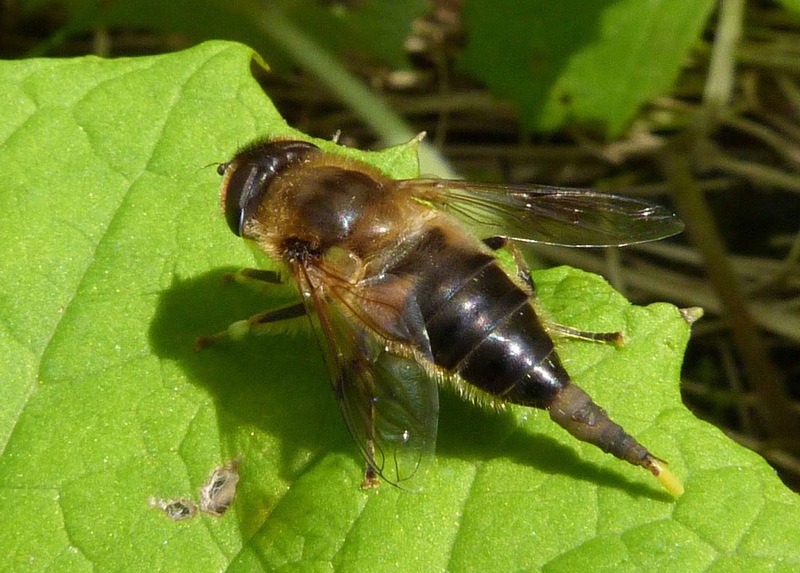 This hoverfly has light brown-orange legs with black ‘socks’ and noticeable bristles on its bottom and round its scuttelum (the triangular section at the end of its thorax). 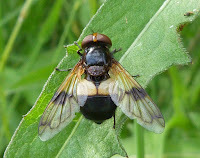 This was found as is commonly the case beside boggy marshland. Although harmless, its size and bee/wasp like appearance and loud buzzing in flight, makes this hoverfly a rather fearsome creature. Some texts I've read say that these hoverflies prefer red and purple flowers such as thistles, but the one at the bottom is obviously a rebel hoverfly and has clearly decided to buck the trend. A very attractive insect. 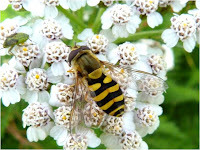 This hoverfly is very similar to the one above, Sericomyia silentis, but as you can see this one is smaller and its stripes are narrower and paler - almost white rather than yellow. Also the wings of this one are brownish, whereas the wings of Sericomyia silentis are mainly clear. 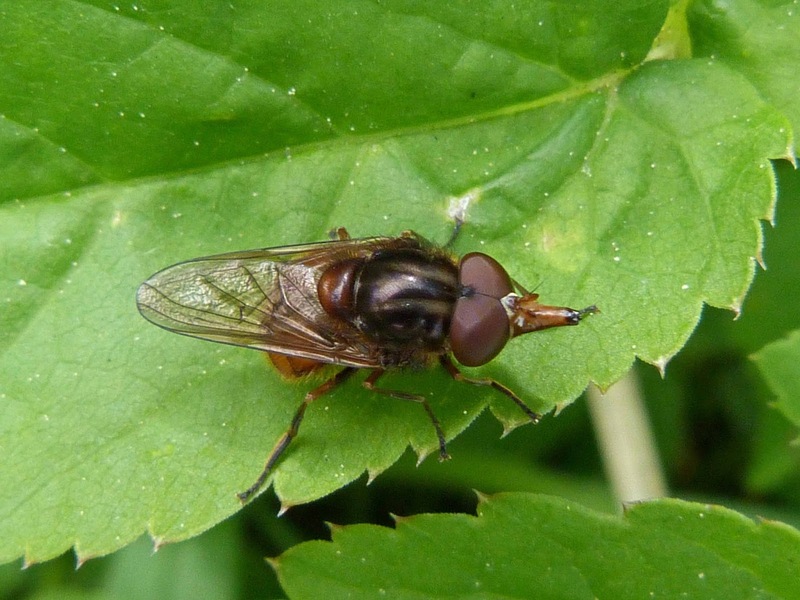 The reddish-brown scutellum (the bit behind the thorax) also makes this species fairly easy to identify. 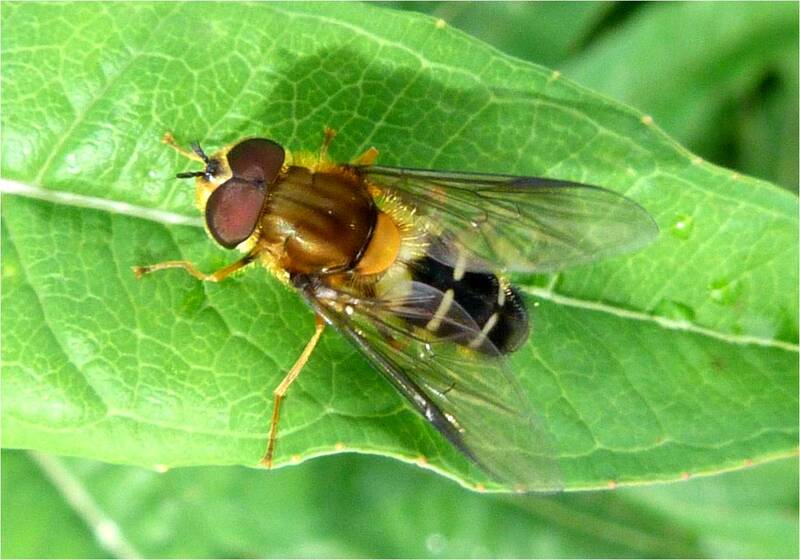 Theses hoverflies are found in boggy, marshy grassland. 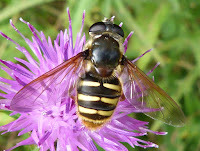 This is a stunning hoverfly and these photos don't do it justice. The black is very black and shiny and the yellow is a really bright yellow that almost doesn't look real. It has three bands of yellow, the one nearest the head being the broadest. The abdomen is quite large and diamond shaped. Males have two yellow 'dashes' behind its scuttelum (the triangular brown bit behind the shiny black thorax) which is why I know this one is a female. It also appears to have a yellow 'face'. These hoverflies apparently like yellow flowers such as buttercups and dandelions, but none of my hoverflies ever appear to do as they're told! I don't know how common this is, but I certainly haven't seen many around so I don't think it can be that widespread in Scotland at least. Whilst many hoverflies are difficult to tell apart, this on is quite distinctive with its two bright yellow bands (hence its Latin name) spaced well apart. The wings also have a brownish tinge with a large chocolate-brown smudge on each. 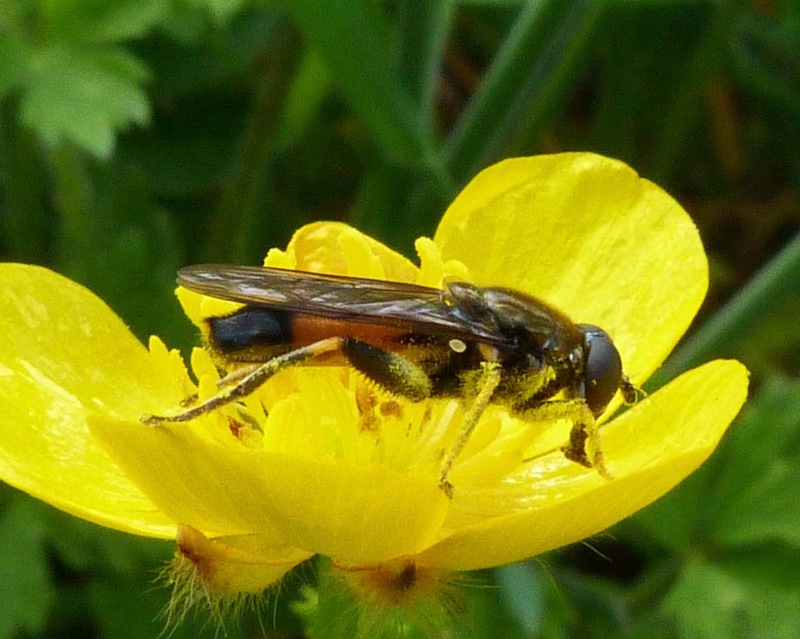 The legs are brown and yellow and the antennae seem to be quite large and thick. 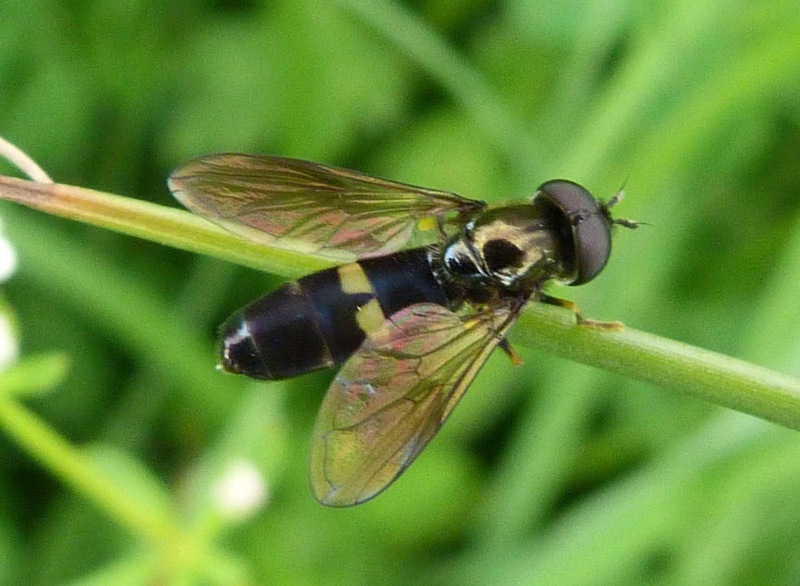 It is quite a small hoverfly but the yellow bands are so bright they are almost luminous making it conspicuous amongst the grass. This was found in wild grassland towards the end of August, just when I'd given up hope of finding any new insects for the year. I think this is more common across England and is far less common in Scotland. 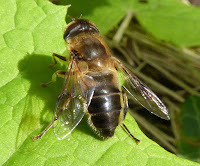 Interestingly, this hoverfly seemed to 'burrow' into the ground after I finished taking photos of it. A really beautiful little hoverfly with a distinctive bulbous abdomen and brownish wings, although I have seen some books refer to it as 'small and dumpy' which seems a bit harsh to me. It is more prevalent in the north than it is down south, and in fact seems to be absent altogether from the very south of England. 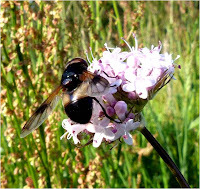 It is difficult to see from this photo, but one of the clear identifiers of this species is that the length of the third segment of the antennae is longer than the other two segments added together. 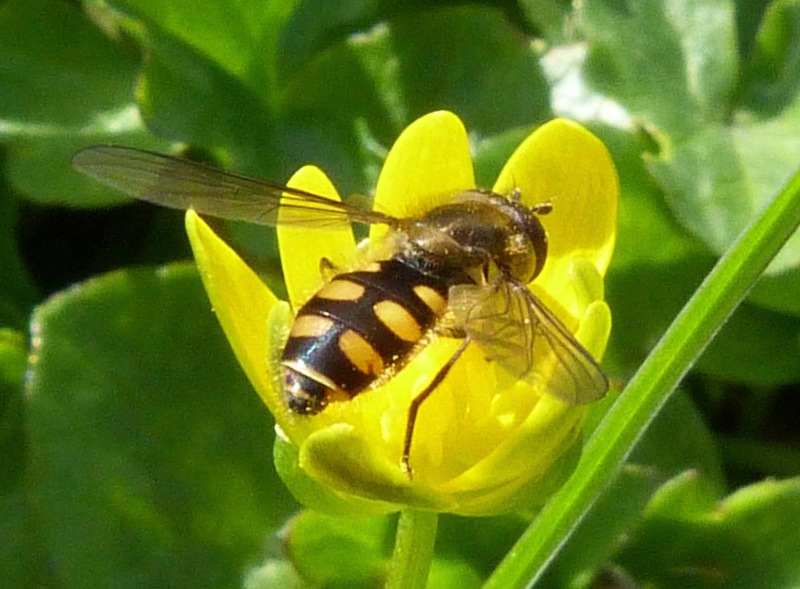 A real treat to find this attractive hoverfly, though it only hung around for a couple of photos before it flew off unfortunately. Whilst the markings on this hoverfly are quite distinctive, what really helps to identify it is the time of year it was found. 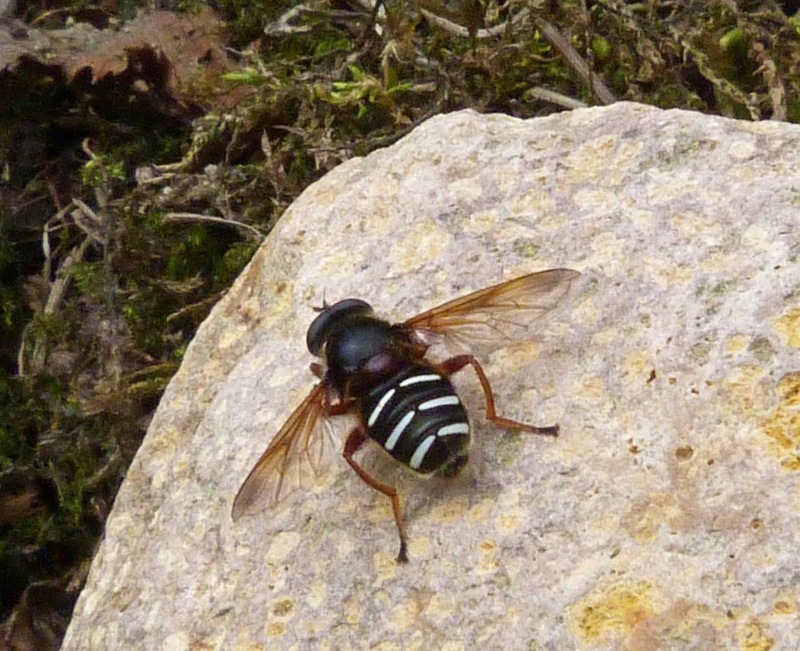 It was found in early-mid April - one of the first insects I spotted this year. It has three wide and straight 'stripes' that don't meet in the middle. 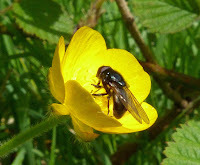 There were many of these little hoverflies visiting buttercups and is a welcome sign that the 'bug' hunting session is about to begin again after a long buy-free winter. Not the sharpest photo in the world I'm afraid, but still clear enough to be able to identify it. A rather attractive hoverfly with a shiny black abdomen save for the pair of pale yellow markings. What's even better about this hoverfly is that these markings are unique to this species of hoverfly and so it can't get mixed up with any other species. 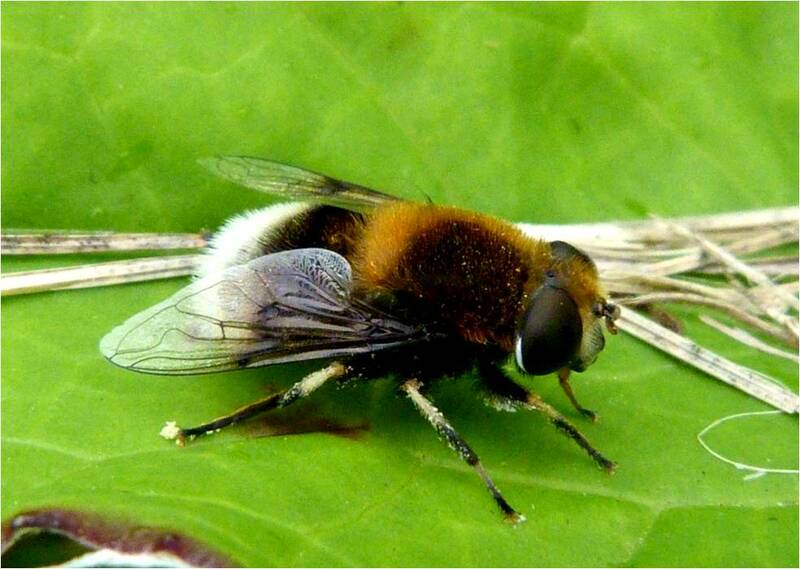 This was found beside a pond which is typical as they can often be found in abundance beside ponds and ditches. A very large shiny bumble bee-like hoverfly with an unusual half black half white abdomen and black legs. The white stripe across its abdomen can be all white with just a hint of black in the middle (as with the photo on the left) or the white can be dissected with a black line (as with the photo on the right). The wings are mainly clear, but each one has a dark patch on it. 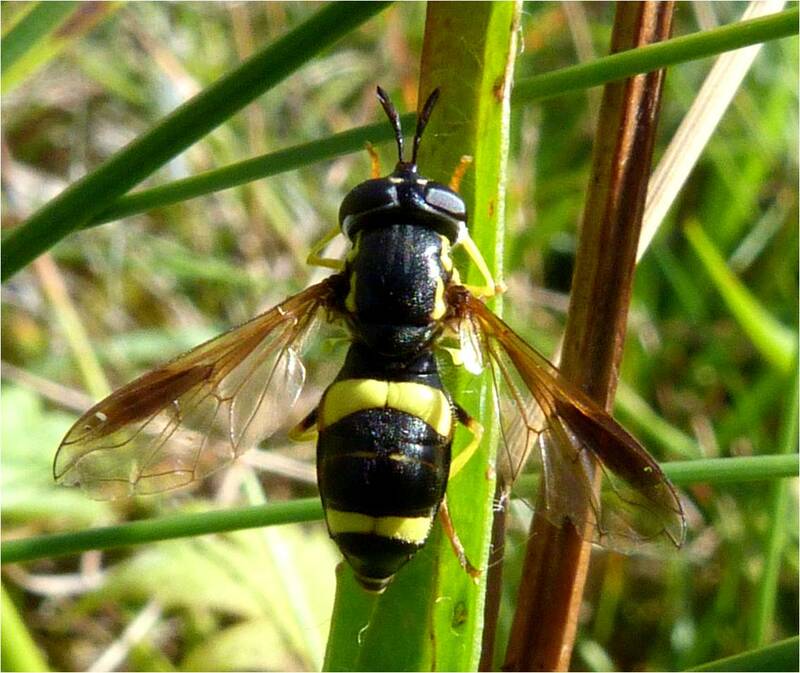 It lays its eggs inside the nests of wasps and bees where the larvae scavenge. 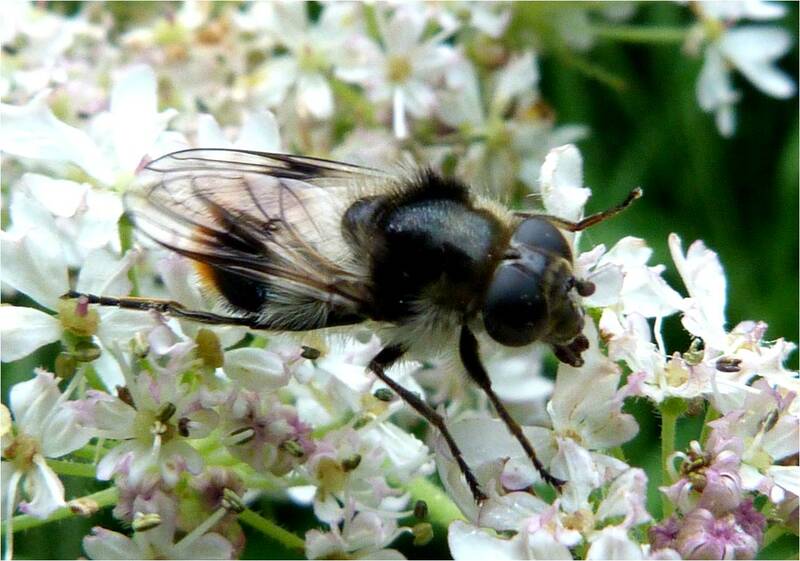 This hoverfly is very similar in appearance to Leucozona lucorum below, but Volucella pellucens has black thorax and scuttelum (the triangular section at the end of its thorax), whereas Leucozona lucorum has browny-orange thorax and scuttelum. 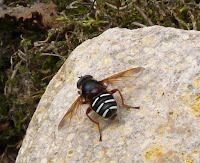 Whilst these photos aren't bad at all (if I don't say so myself) this hoverfuly was even more stunning in real life. It happily posed for photos for ages while it soaked up the sun. It truly is one of the most eye-catching insects imaginable. As I mention above, the only hoverfly this could get confused with is Volucella pellucens (see above), but Volucella pellucens has a black thorax and scuttelum (the triangular section at the end of its thorax), whereas Leucozona lucorum has browny-orange thorax and scuttelum. The photo is of a female as males send to be darker than the females. This is a lovely hoverfly which is commonly found on Hogweed when it's sunny. 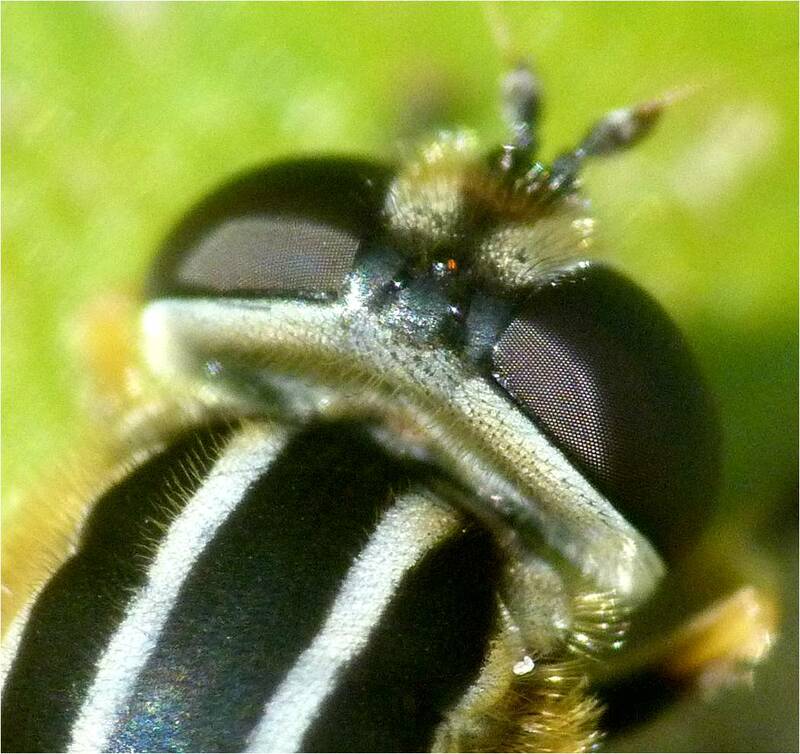 This female (with the eyes not touching) has a dark scuttelum (the triangle behind the thorax). 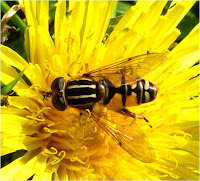 This distinguishes it from the hoverfly below which looks very similar but with a bright yellow scuttelum. 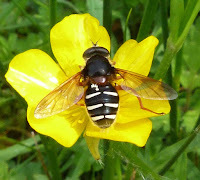 This hoverfly, as with the one below has black stigma - the black markings at the edge of each wing. 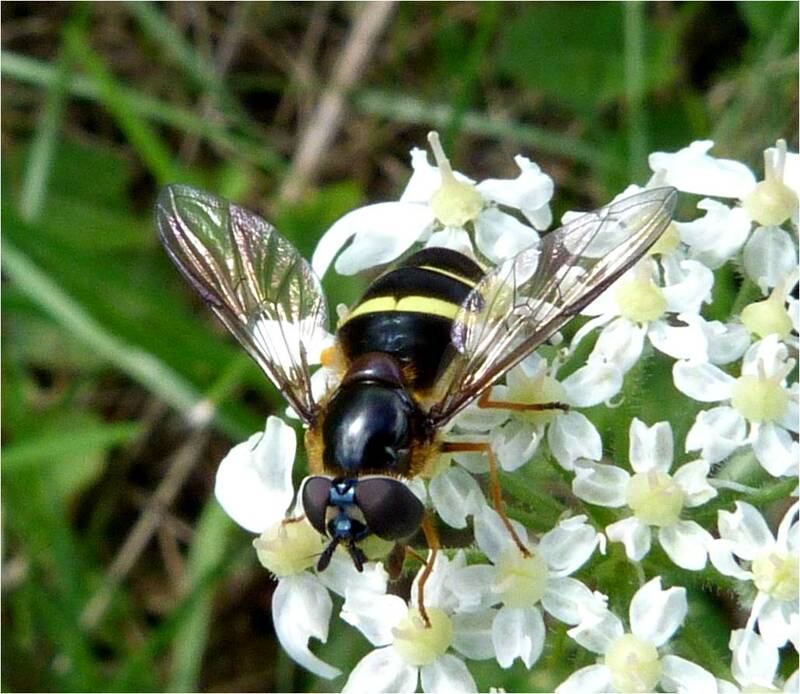 The white markings on the thorax and the yellow scuttelum make this hoverfly very distinctive. The females' markings are instead a bluish colour as can be seen from the photos at the top. 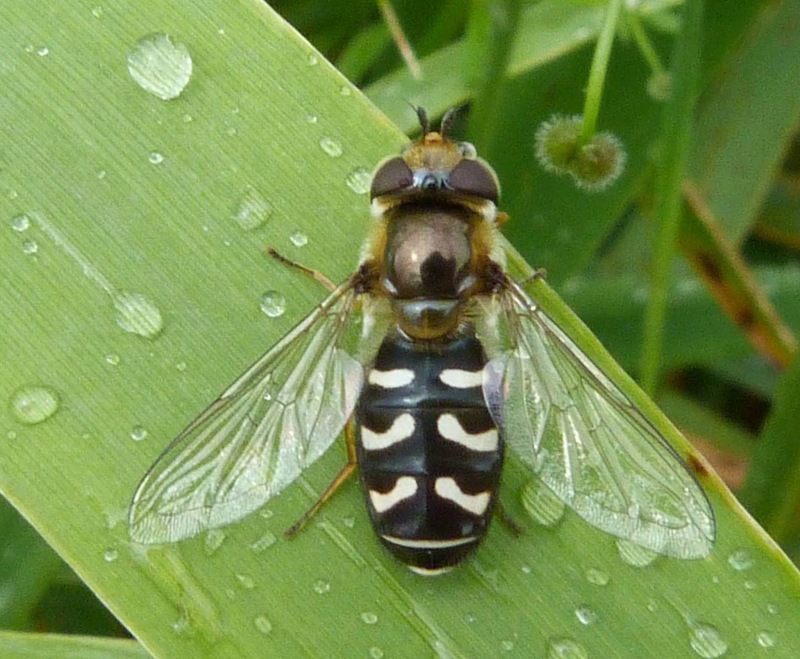 The two narrow whitish/bluish bands and the dark markings on the outer wings make this hoverfly easily identifiable. 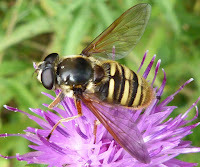 It’s a really beautiful hoverfly and the photos of the males at the bottom in particular don’t do them justice. 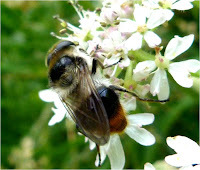 I actually thought this was a white tailed bumble bee at first and had 'identified' it on this website as such. It is certainly furrier than your typical hoverfly and many authors have commented that it is a bee mimic. 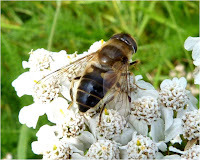 But I'd like to thank a visitor to this website for letting me know that this really is a fairly common hoverfly by the name of Eristalis intricarius. 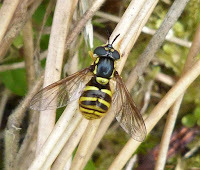 As well as the white tail, its legs are black and pale yellow. 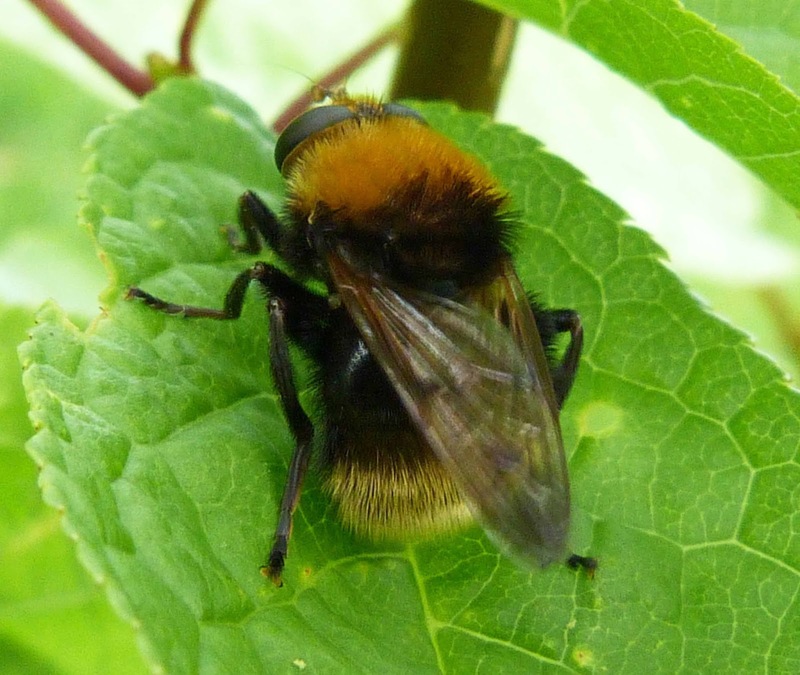 Having learned my lesson from the hoverfly above, I realised that this too could be a hoverfly rather than the bumble bee it looks like. 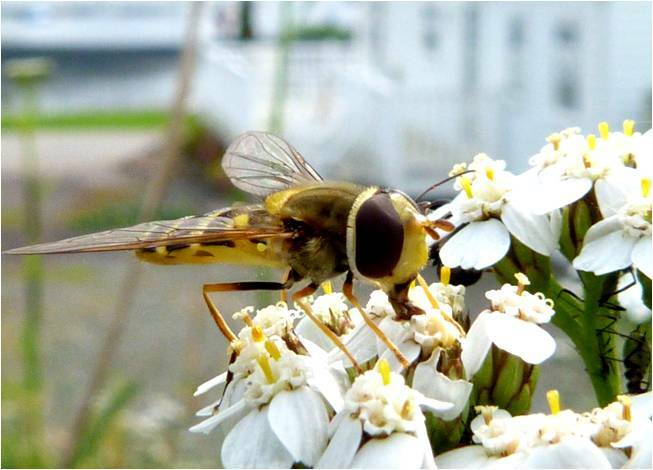 I think the easiest way to tell bumble bee mimicking hoverflies from true bumble bees is their eyes. 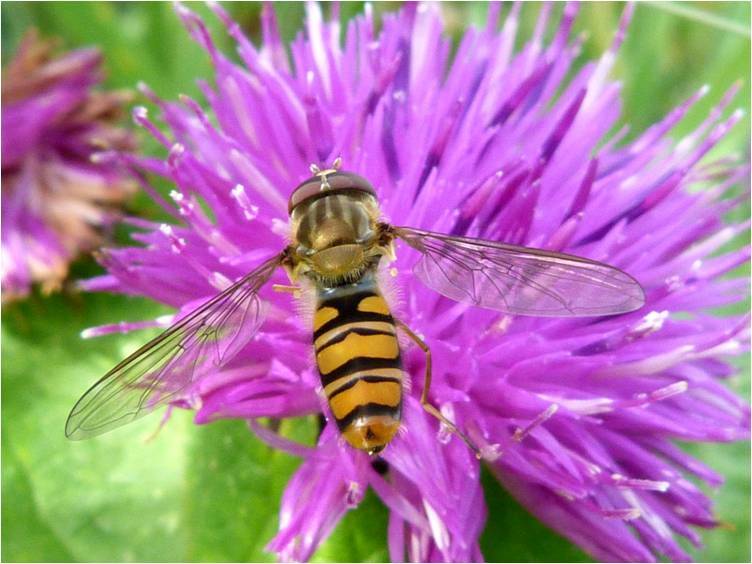 Hoverflies have huge round eyes which take up most of their head, whereas bees seem to have smaller oval black shiny eyes. Whilst this hoverfly looks very like the one above, this one has a distinctive yellow 'tail' rather than a white one and its legs are entirely black. I found it really difficult to identify this one, and for the umpteenth time, I am very grateful to www.ispot.org.uk who helped me identify it quicker than I could blink. 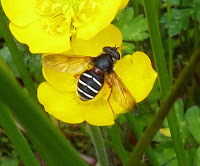 Yet another hoverfly that is a bumbe bee mimic - although perhaps less convincingly so than some of the others. This attractive looking hoverfly can be identified by its white hairs and orange tip to its abdomen as well as the black stripe across its thorax and the broad shiny black stripe on its abdomen. 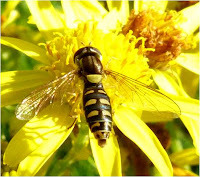 In addition, and although some other species of hoverfly have this, it has black markings on its wings which can best be seen in the photo on the bottom left. 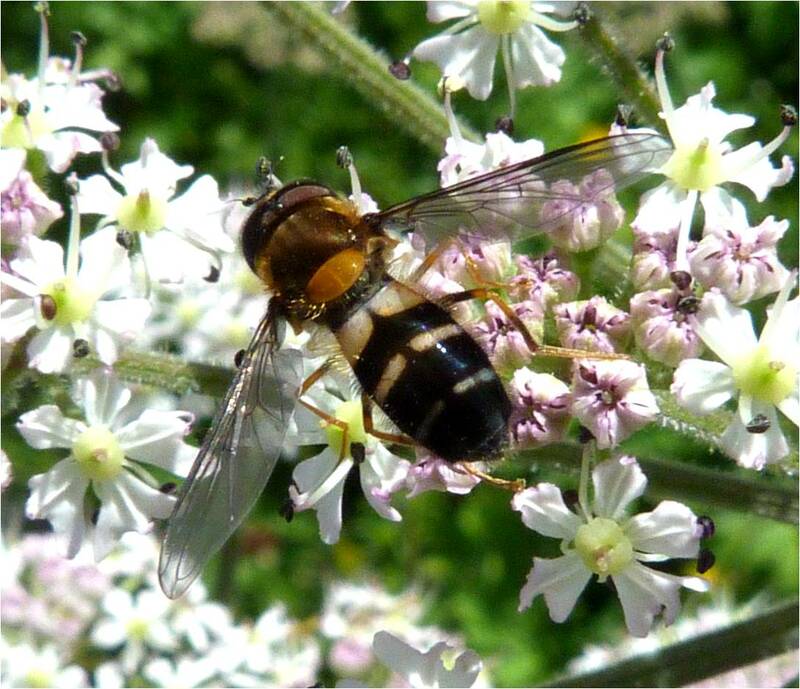 These hoverflies are strongly associated with Hogweed and, unlike most of my other hoverflies above, the one I've photographed here is actually behaving itself and sitting on the 'correct' plant. 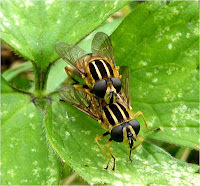 The male and female display the “typical” eye pattern here, with the male’s eyes touching one another to create a Tom Cruise Top Gun goggles effect and the female (being approached from the rear by the male) with eyes apart. This hoverfly is rather small with a narrow abdomen. 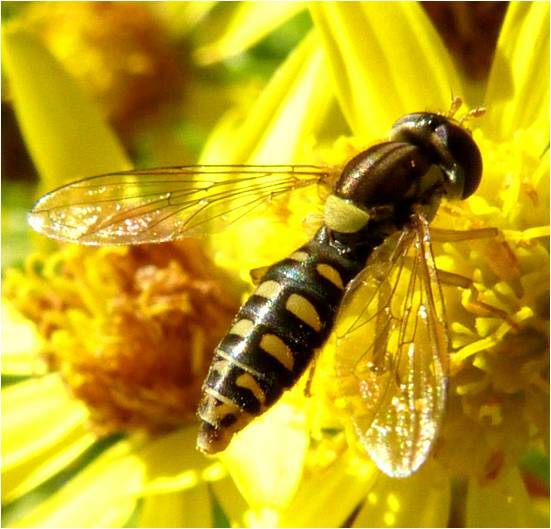 They can occur in large numbers mid-Summer. 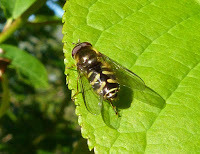 I was pretty excited when I saw this hoverfly at first as its legs make it is quite eye-catching, but then I saw another one, and another one, and before you know it I was going to scream if I saw one more of them. 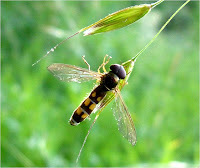 It has noticeable black and yellow striped legs, a greenish metallic thorax and and orange abdomen which is difficult to make out when its wings are resting on top of its abodmen, although is visible from the side, as in the top right photo. Unlike the male of the species whose eyes touch one another, the female's eyes are separate. From this photo, it looks like the part of the head between the eyes is metallic blue, but perhaps it is just the way the light was shining on this hoverfly, as no one else seems to make reference to it. 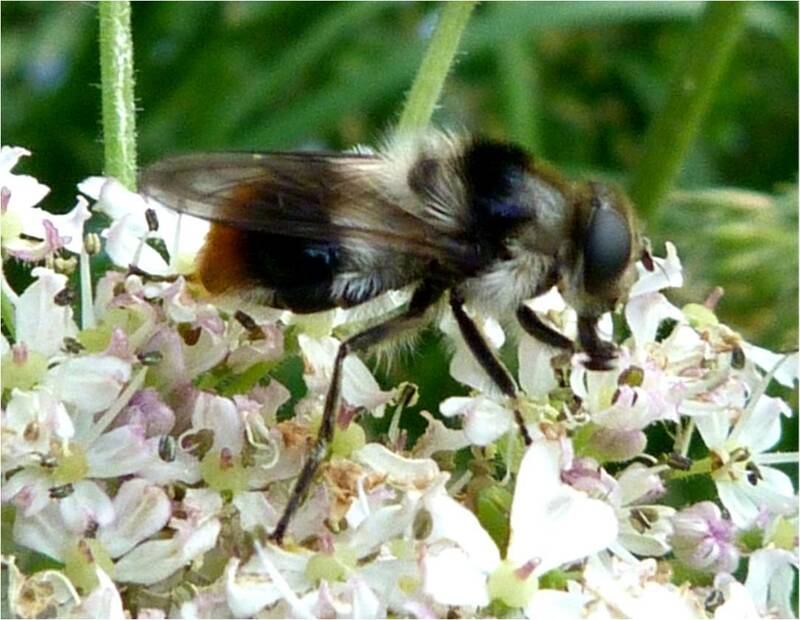 There are a number of other very similar species, but these tend to be located in England and are far rarer up in Scotland. 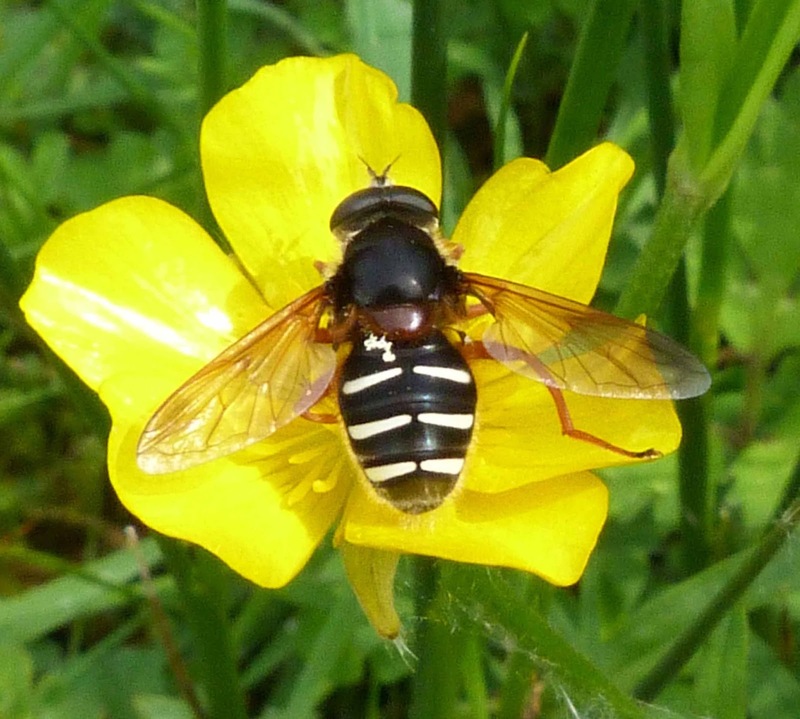 The only other remarkable thing about this hoverfly is that particularly at rest, it doesn't look like your 'typical' hoverfly. When it flies off, however, it does have that peculiar hoverfly-like flight about it. Interestingly, these hoverflies apparently rarely visit flowers in England but do visit flowers such as Meadowsweet and Angelica in Scotland (although of course mine's on a buttercup...). Anyway, all very strange! These photos aren't very good as I thought they were just some sort of black fly until they took off, at which point I realised (as they hovered around) that they were in fact hoverflies and they were quite large with shiny black thoraxes. 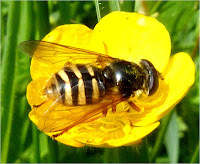 As you can see from the photo on the right, their abdomens are a sort of metallic-grey colour and they like buttercups where they will lay their eggs on the underneath of them. 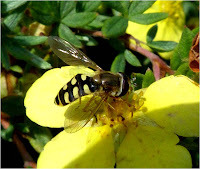 Will need to get better photos, as there were plenty of these hoverflies flying around in the sunshine, although in truth, they are not the most exciting-looking creatures I've ever come across. The males have hairy eyes whilst the females do not. The species mentioned are almost identical and would need inspection under a microscope to identify the slight difference in shape between the front tarsus of each species! 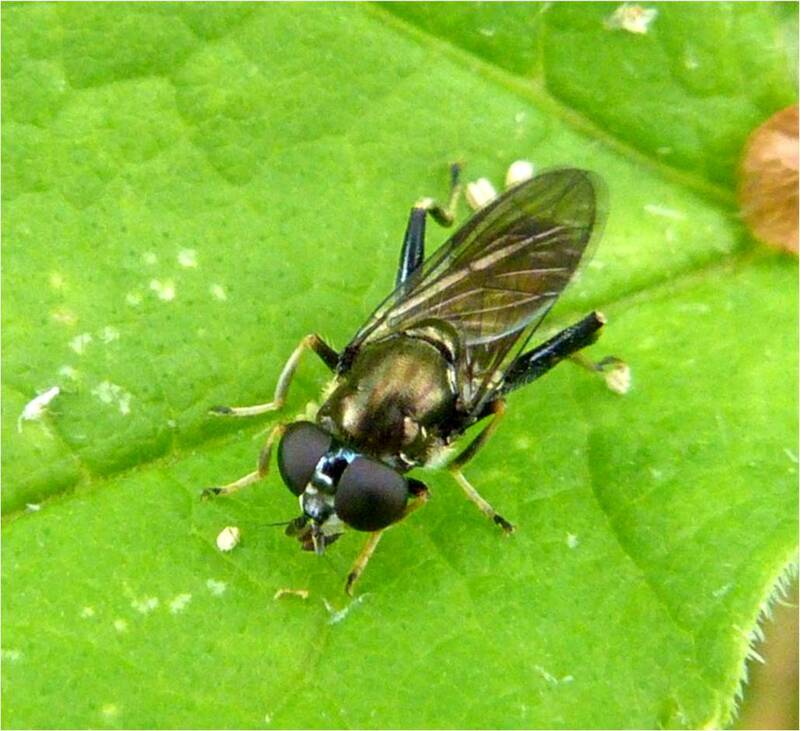 But thank you once again to Mike Kerry for suggesting this may be Cheilosia impressa, although there is uncertainty due to the location of where this was found. 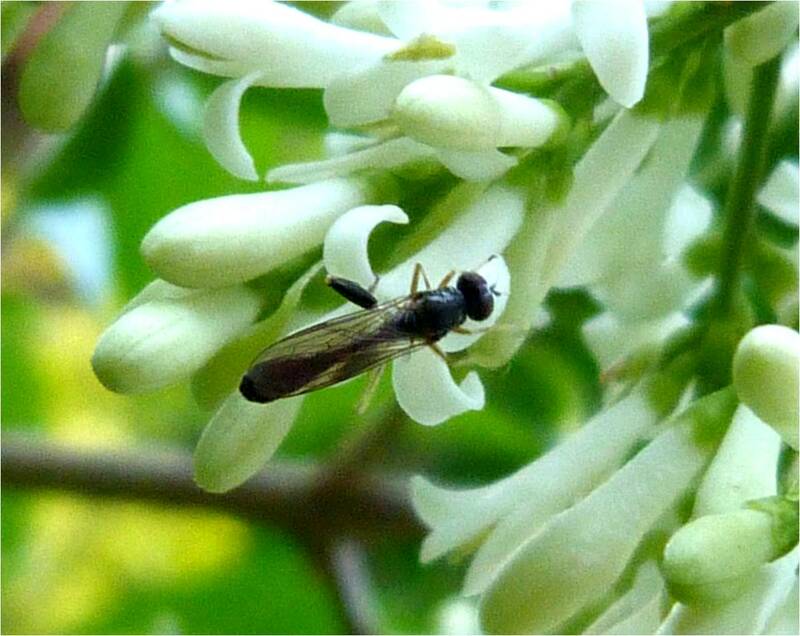 I understand from Mike that the tarsii don't look pale enough to be either C. albitarsis or C. ranunculi. 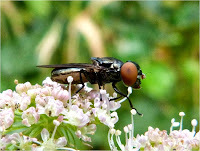 I was completely unable to identify this insect and so I sent a copy of these photos to Florin Feneru at the Natural History Museum who provided me with very quick and helpful assistance. 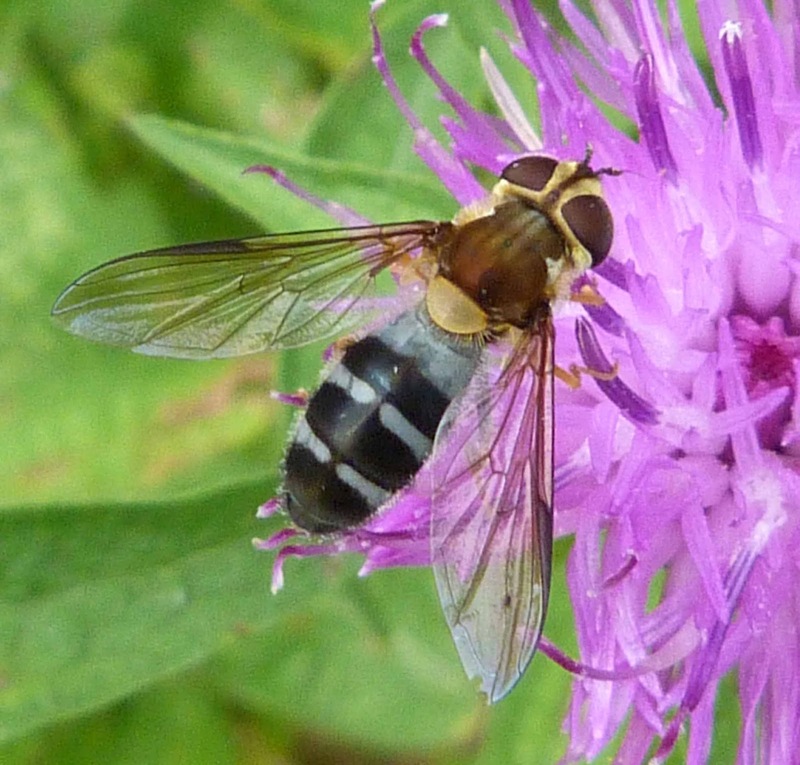 It turns out that this hoverfly is a Sphaerophria sp. but as it is a female, it is not possible to determine what species it is and only the male can be identified with any certainty. 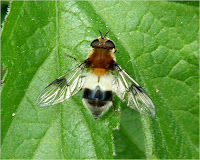 The colour of the markings on the abdomen of females can vary from cream to yellow to orange. It has similar characteristics to a Sphaerohphoria fatarum. Whatever species it is, it is a very attractive looking hoverfly. An usual hoverfly, not being the 'usual' black and yellow bee/wasp mimic. A pretty grainy photo I'm afraid, but hopefully it's just good enough to demonstrate its distinctively shaped abdomen which can be soon through its wings and the black swollen 'thighs' of its hind legs. 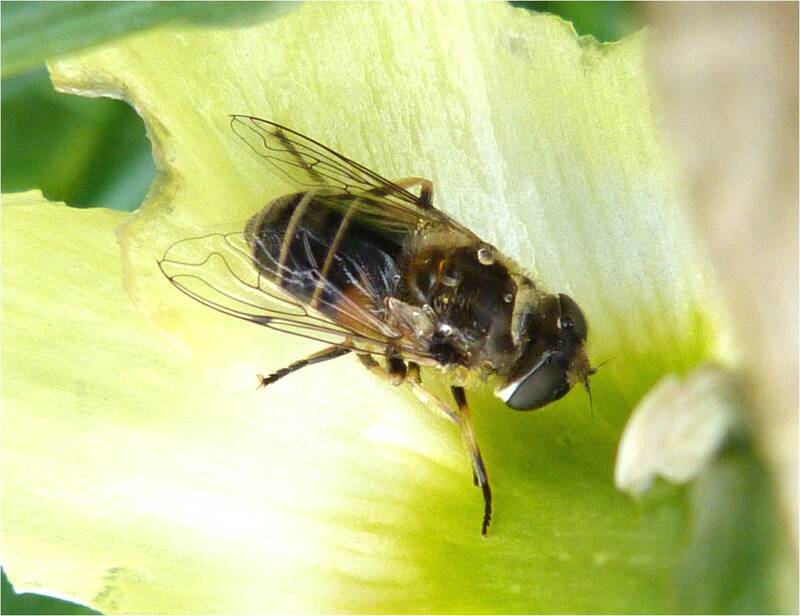 It seems as if the male of this species has a yellowy-cream stripe towards the end of its abodmen. It also seems that these insects prefer more shaded, woodland-type areas, although, as here, they will come out occasionally and visit flowers on more overcast days. I was completely unable to identify this hoverfly, so many thanks to Florin Feneru at the Natural History Museum for identifying this one for me. 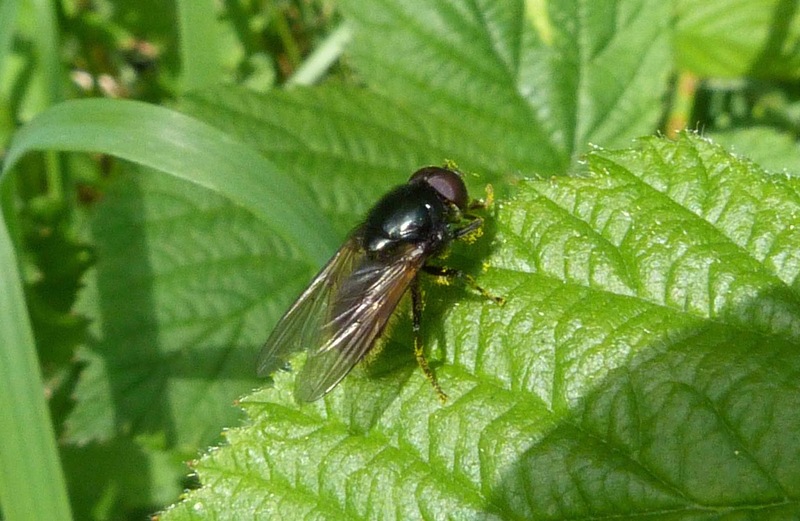 A large shiny drone fly – so shiny that you can see my reflection on it abdomen in the top photo. 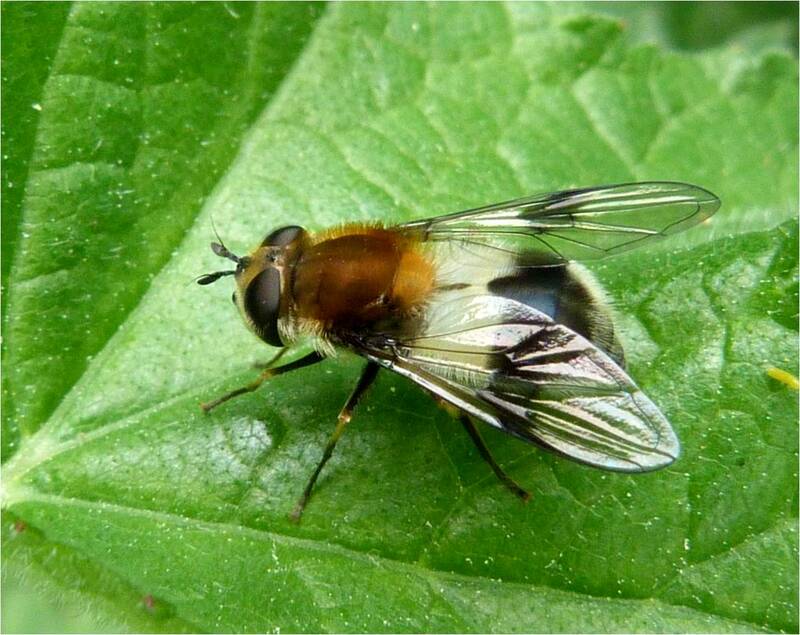 Beautiful clear wings with a dark patch on the outer edge of each. As the name suggests, it is distinguishable from other drone flies by its strongly tapering abdomen. I was lucky enough to capture a female ovipositing i.e. laying an egg in the photo in the middle, which was an amazing thing to witness. Thanks also to www.ispotnature.org who confirmed the ID of the middle photos explaining that it is probably E. pertinax as it seems to have yellow front and middle leg tarsi - i.e. the ends of the legs are yellow. I was lucky enough to see this male hovering above the female for about a minute or so, presumably as it was trying to impress her with his hovering skills. His wings were beating like the clappers and the poor bloke looked competely knackered by the end of it. But the female clearly wasn't impressed as she would have nothing to do with him. 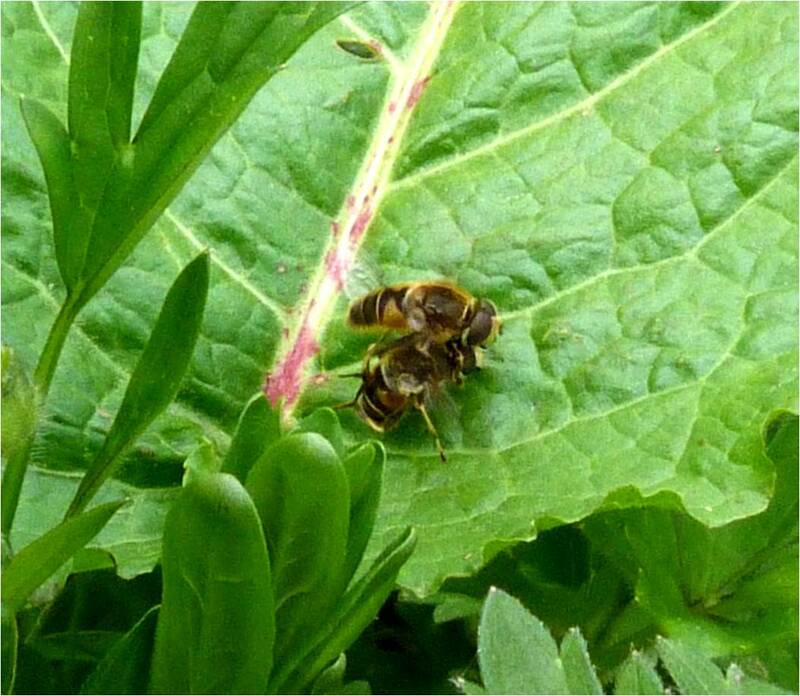 His attempt to mate failed as she gave him the brush off, but if it's any consolation to him, I was very impressed. 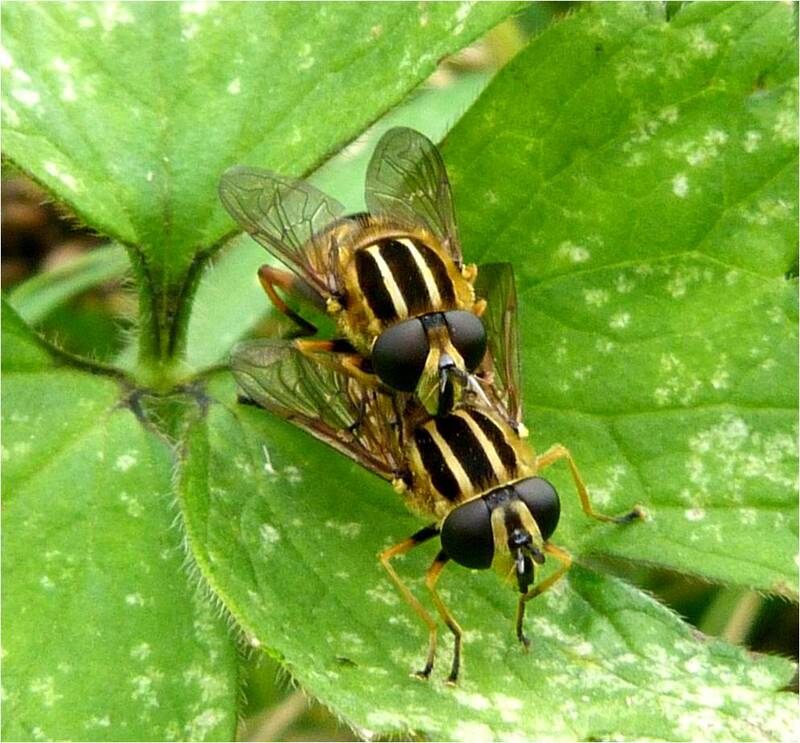 Many thanks yet again to Mike Kerry who identified these hoverflies for me and advised that they have small sharp wing stigma and this typical behaviour of the male hovering over the female. 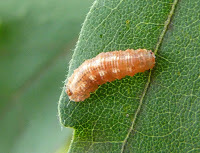 Hoverfly larvae eat a wide range of foods. 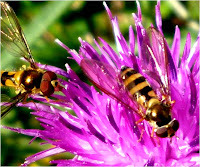 Some species eat plant or animal matter whilst others prey on aphids and other insects. 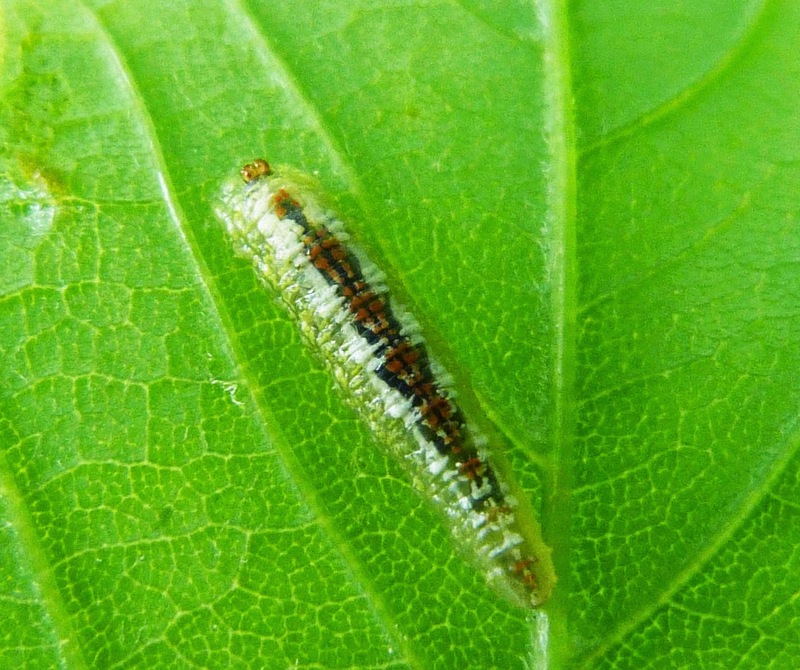 Because aphids cause such extensive crop damage, some species of overfly larva are used for pest control purposes. 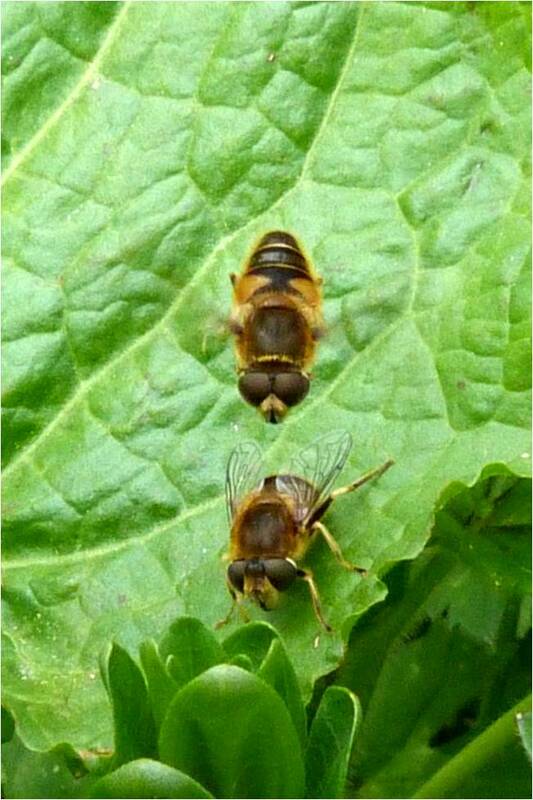 I'm afraid I haven't delved into what species of hoverfly these are, although there are some studies on this alone - so someone out there will probably know!